FIDELet’s play for 6 and a half hours. At the World Chess Championship in Sochi, Russia, Monday’s Game 7 ended in a draw. Well, it was a bit boring at the end — after more than 100 moves had been played! It was fairly clear where the game was headed by this point, but it continued until move 122, consuming over six hours of challenger Vishy Anand and champion Magnus Carlsen’s lives. For the first 30 moves or so, viewers were treated to the unique spectacle of Grandmaster preparation. 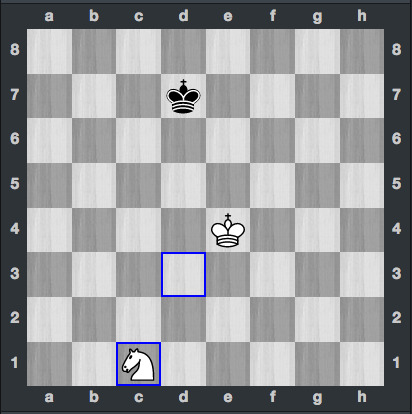 If you’ve been following my game recaps, you’ll already be family with an opening known as the Berlin Defence in the Ruy Lopez. You can bone up on it here. The game was a must-win for Anand, who lost a heartbreaker in Game 6 after missing a blunder by Carlsen that could have ended the encounter in one move. So for the 44-year-old Indian, it was mission accomplished: He would have preferred to come out of two consecutive games as black with a score of 1.5-0.5 in his favour, making the match score Anand 4, Carlsen 3, with five game to go. But then again, there was a good chance that, with the white pieces, Carlsen would win at least one of his two white games. Anand’s task, especially in Game 7, was to be sure that he notched a draw. To do it after such a long game shows that he’s recovered from the Game 6 loss. The 23-year-old Carlsen gave his older opponent ample opportunity to crack under the stress, and the setup was vintage Carlsen, the reigning king of the grinding endgame pressure-cooker. This is the Norwegian’s Elysium, his glad and happy place — and the context of many a foe’s misery, tears, and trembling collapse. The Berlin Defence, as I’ve already noted, has a reputation at GM-level play for yielding draws. But those draws certainly aren’t automatic. In fact, as Game 7 proves, they’re far from automatic. 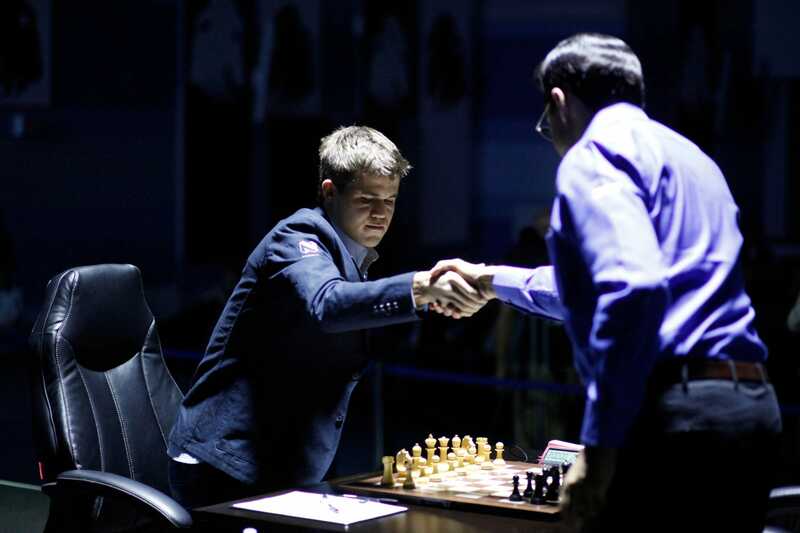 Additionally, Carlsen, prior to Game 7, had busted Anand in the Berlin twice. Anand played the opening four times in the 2013 WCC and lost one. And in Game 2 of this year’s match, Magnus crushed Anand, smashing his “Berlin Wall” to pieces. Interestingly, from an intellectual standpoint, endgames can be the most demanding part of a game. They have all been extensively studied and, unlike the middle game (where tactics can come to the fore) or the opening (where extensively prepared lines of play can be critical), the endgame demands precision. One bad — One! — move can literally be the difference between a win, a loss, or a draw. It was a strange endgame, in that Carlsen perhaps hung in there it to deplete Anand for the rest of the match — but there were points when Anand looked as if he might be able to do something with the imbalance of his pieces versus Carlsen’s. ChessBombThe final position in the game — an automatic draw. The position is instructive, because it’s an automatic draw — there’s no way for Carlsen to win the game with a king and knight versus a lone king, because the white side doesn’t have enough “material” to deliver checkmate. The black king can always get away. 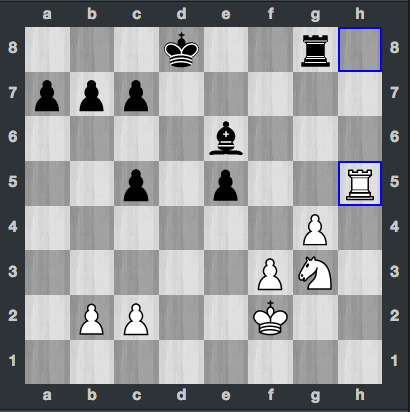 ChessBombAnand will sacrifice his bishop by taking the pawn on g4. It might look basically even, but it isn’t. Anand has “structural” problems. He has five pawns to Carlsen’s four and a bishop and a rook versus a knight and rook. But two of Anand’s pawns are “doubled” on the c-file, and one is “isolated” on the e-file, unprotected. But Anand can use his remaining pieces — all of them, his king, rook, and pawns — to gang up on white’s pawns on the c2 and d2. He actually needs to reduce Carlsen’s pawn force, and he does this by taking the pawn on g4 with his bishop. It’s a “sacrifice,” but as many observers of Game 7 pointed out, it allowed Anand make it from move 31…to move 122! Anand loses the e-pawn in the process, but Carlsen ends up with a lot of Anand’s pawns staring down at the two pawns he has remaining — and Anand can now effectively use his king as a sort of “super pawn,” joining the attack. Carlsen doesn’t have a solid chance of promoting one of the pawns to a queen. Anand could get one of his pawns home and make a queen, but he also has to contend with white’s bishop and knight. Extensive manoeuvring followed, until it became apparent that a draw was in the cards (or the pieces!). After Game 6, I kind of expected a long struggle. Carlsen’s goal was to put Anand away, securing his WCC defence — a margin of two wins, even with five game remaining in the match, would be exceptionally difficult for Anand to overcome. Anand’s goal was to stave off that fate. By any means necessary. The result proved that the Berlin Defence can still produce a draw. But it was an epic struggle. 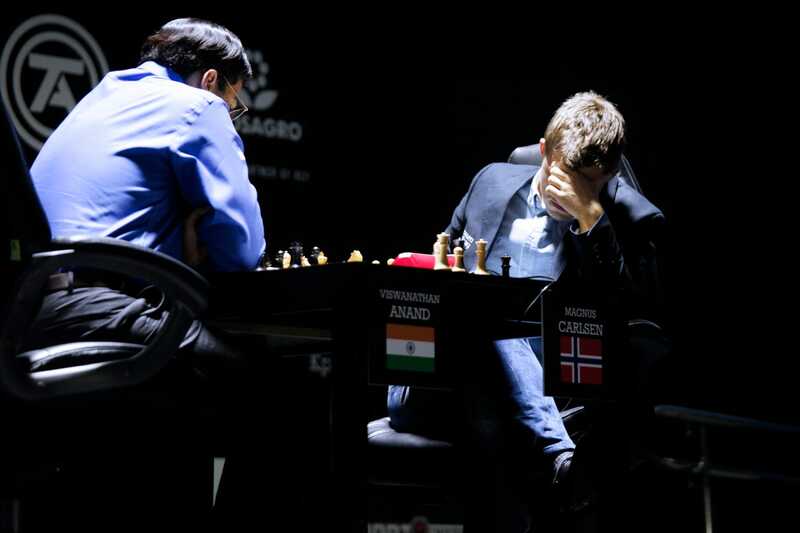 Both Carlsen and Anand have to be completely exhausted. And on Tuesday, they will be back. Anand will have white. But will he have the energy left to go for a win? He’s behind by a point, so he needs to find that energy and find it fast. You can watch the Game 7 replay here — and be sure to fast-forward to the end if you don’t want to watch the whole thing so you can listen to what happens to a Grandmaster like Peter Svidler, doing commentary, when he’s had to talk about chess for almost seven hours. Hilarious.